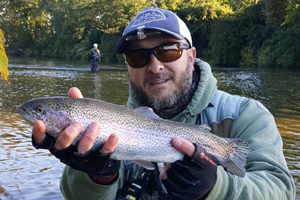 Wesley operates Wesley Hodges Fly Fishing out of Blacksburg Virginia, his passion is chasing Trophy Smallmouth and Musky on the New River along with offering some incredible destination trips for trout in western Virginia. Wesley will be joining the South River Fly Fishing Expo crew for the first time this year and will be presenting on Trophy New River Smallmouth. 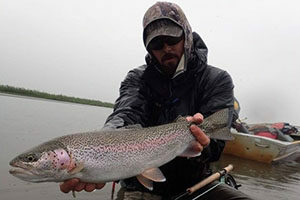 Ben has been guiding clients on the Kanektok River in Alaska for years and will be joining us this year with a presentation on some of the finest King Salmon, Silver, Salmon and Rainbow Trout fishing in the world. 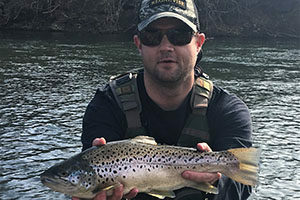 Reed began pursuing trout with a fly rod during his days at Appalachian State University and has been a regular on the South River since moving to the Waynesboro area. Reed joined the guide staff at South River Fly Shop in 2014 and has been a favorite of clients ever since. Reed’s presentation will be an on the water nymphing lesson including flies, rigging, reading water, and fly presentation. My name is Pat Cohen. I live in upstate New York where there is an abundance of warm water streams, lakes, and farm ponds to fish; although most anything with gills is fair game. I was always a terrible fisherman with spin and casting gear, but I began fly fishing in 2008 and since then I have caught more fish than I can count. I have been tying flies since January of 2009. Fly fishing and tying have become an essential part of my life. Since 2012 I have been a full time commercial fly tyer and designer. I have created materials, dubbing and tools for fly tyers. One of the most well known is the Fugly Packer..which is a packing tool for the making of bass bugs. I specialize in warm water predatory flies, although I am best known for my deer hair bass bugs. The artistic freedom that fly tying offers is what drew me to it. All of my flies are meant to be fished with the exception of the display offerings. I enjoy the blending of natural with synthetic materials to create flies that maximize the triggers that make predators eat. I have blended my knowledge and passion for art with my knowledge and passion for fly tying to create a very unique approach to fly making. I have been accused of being a lure maker from time to time…but honestly I find no offense in that at all, as all flies are lures. My passion for all things fly began with both Smallmouth and Largemouth Bass. I am to this day still passionate about these wonderful fish. I have designed numerous flies around the pursuit of them. I have an obsession with the custom tackle industry and figuring out ways to bring that technology into bass flies. One of my latest creations for doing just that is the Cohen’s Creature Ultra Suede series. It was a perfect way for me to bring the movement and success of soft plastics into fly tying. I have a deeply ingrained passion for chasing golden bones; carp on the fly is a challenge that more and more fly anglers are only beginning to appreciate. Carp are by far one of the most difficult fresh water species to hook with a fly, and I’ve created a wide variety of nymph patterns to target these misunderstood and often maligned game fish. I created a very unique dubbing called Cohen’s Carp Dub to help create more convincing carp flies. I have an obsession with Pike on the fly as well. I have designed a selection of streamers and materials to aid in the pursuit of the water wolf. The power and explosion of these incredible game fish is second to none. There is nothing in the world like hooking a big pike on a glass rod while standing in a kayak if you ask me. I have three instructional DVDs on the market teaching my deer hair techniques. I also have a youtube channel offering free videos. My flies have been featured in multiple magazines and books over the past several years. You can follow me at facebook.com/theinkedfisherman or visit my website rusuperfly.com for my products. I am a member of the pro team for Epic Fly Rods, 3Tand Reels, Peak Vises, Loon Outdoors, EP Flies, Dr. Slick, Under Armour, Jackson Kayak, Werner Paddles, Carp Pro Magazine and Partridge of Redditch Hooks. Hareline Dubbin distributes some of the products that I have created. I regularly demonstrate and teach fly tying. I also do presentations on these great warm water species at various events and fly shops on the east coast. L.E.Rhodes has been fishing the James, its tributaries and the Shenandoah for over 45 years and guiding on them since 1999. L.E. 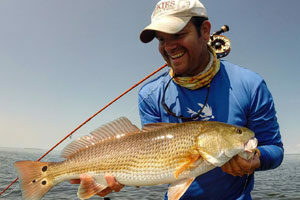 is also an accomplished fly tier providing anglers and shops with local and time honored favorites. As an instructor L.E. loves to introduce fly fishing to beginners as well as those who want to tune up their casting or knowledge. L.E. 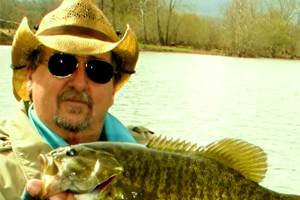 ‘s easy going attitude and desire to put anglers on fish makes him one of the most sought after smallmouth guides in Central Virginia . 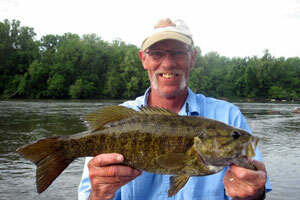 Get him talking about smallmouth and you’ll see a true passion of love and knowledge of the fish and its resource. 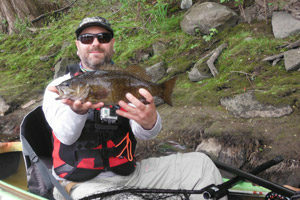 Two decades ago, Chris picked up a fly rod at age twelve to throw poppers for bass and sunfish in Virginia farm ponds. The addiction was immediate and he would be forever bound to the allure of fly fishing. “Fly tying disease” followed shortly thereafter and the family Border Collies provided tying materials for his first hand tied flies as a kid. 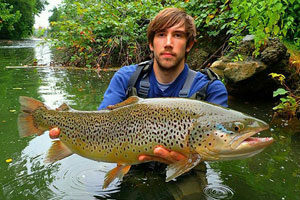 Post college, Chris cut his guiding teeth as a trout bum in Aspen, Colorado and found that he loved teaching the sport. Returning east a few years later, he continued guiding and tying professionally and started his own business, Knot the Reel World Fly Fishing, in his new home of Richmond, Virginia. These days, he’s often on the road guiding in Virginia, North Carolina and Colorado and fly fishing everywhere in between. When he is not traveling or fishing he can be found in his tying den concocting new flies for all varieties of fish. His clients use his patterns to fish all over the country and world including Patagonia, Mexico, the American West, and of course the East Coast. He loves to teach fishing and tying tactics for various species in unique locations. His favorite quarries are redfish and smallmouth bass and he will be tying unique patterns for these species and many others. He also still ties flies for clients with their family dog hair, upon request. You can find his work at www.knotthereelworld.com. Tommy Lawhorne is the co-owner of South River Fly Shop in Waynesboro. 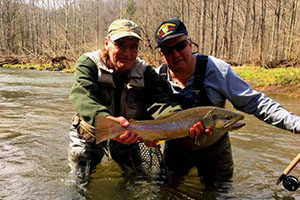 Tommy has spent the last 30 years fly fishing and guiding for Trout and Smallmouth Bass in western Virginia. Tommy is an ardent native Brook Trout fan and has worked with Shenandoah Valley Trout Unlimited and the Virginia Council of Trout Unlimited to restore, protect and conserve native Brook Trout habitat and build better fisheries on our valley spring creeks. Tommy is the current President of the Shenandoah Valley Chapter of Trout Unlimited and is a board member of Destination Downtown Waynesboro. Kevin resides in McGaheysville, Virginia which is located in eastern Rockingham County where he owns and operates Old Dominion Outfitter and Guide Service LLC. 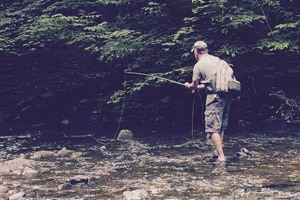 As a lifelong resident of Rockingham County, Kevin spends most of his time fly fishing the small mountain streams of the George Washington National Forest and Shenandoah National Park for native brook trout. When Kevin isn’t fishing for brook trout he can be found on the Shenandoah River fly fishing for smallmouth and largemouth bass, carp, or musky. Kevin started sharing his 30 plus years of experience and knowledge of local waters in 2013 as a full time fly fishing guide and outfitter. Herschel Finch, bought his first Fly Rod when he saw it hanging from the dusty ceiling joists in Hill’s Bait and Hardware in Raleigh North Carolina back in 1969. He still has that rod, Herschel fished from a kayak for the first time in 1998 and never looked back. 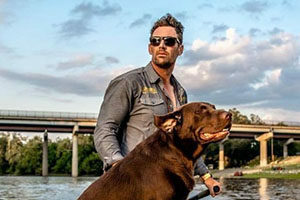 He serves as pro staff for Jackson Kayak, along with Orion Coolers, YakAttack Kayak Accessories and Bending Branches paddles. He lives right here in the Shenandoah Valley in Front Royal, Virginia where he’s also Conservation Chairman for the local Izaak Walton League Chapter as well as for the Potomac River Smallmouth Club. 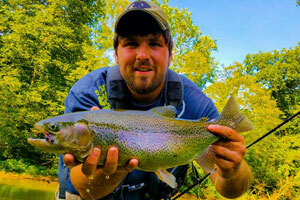 Eric and Hunter are the founders of the very popular Virginia Trout Junkies Facebook Page and have fished all over Virginia and West Virginia for Native, Wild and trophy trout. Their page promotes a strong Catch and Release ethic and encourages the viewers to engage in conservation of trout and trout waters. Eric and Hunter grew up in Waynesboro, Virginia and have an impressive knowledge of the South River and are ardent supporters of this incredible fishery.